Billionaire couple Christopher and Regina Catrambone, who launched Migrant Offshore Aid Station (MOAS) to help save refugees from drowning, are enhancing their efforts in the Mediterranean with the deployment of two ships and two drones. 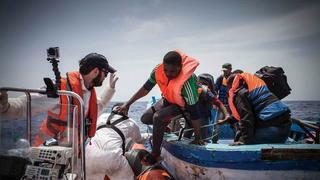 The charity will launch its third season of saving lives in the Mediterranean next week (June 6). This summer MOAS will have a new emergency response and recovery vessel, 52 metre Responder, which will work alongside the charity’s original boat 40 metre Phoenix. MOAS will be further boosted by the use of two S-100 Schiebel Camcopters which will be used to patrol an area called the “dead zone” — the fatal few miles from the Libyan shore. The drones are able to fly for up to six hours and cover 97 nautical miles of ocean while sending back high resolution footage both day and night. “Having drones on board the Phoenix will allow MOAS to be on station in the most deadly part of the journey, the stretch of sea a few nautical miles off the coast of Libya that kills thousands of people, many of whom are buried in unmarked graves,” said Christopher Catrambone. MOAS has saved the lives of more than 13,000 people since beginning its operation in 2014. It works with all stakeholders and is the only charity accredited by the IMRF to conduct professional search and rescue in the Mediterranean. “I am deeply saddened that people are still dying in such horrible conditions. Last week, 45 bodies arrived in my home town Reggio Calabria," added Regina Catrambone. "The majority were women and children. We must not become desensitised by this humanitarian catastrophe. MOAS need the generous support of public donors to keep saving lives. We all have the moral responsibility to end this. Only together we can make a difference”.